The Hopi Butterfly is a traditional social dance that takes place in August and early September over a period of two days. The dance occurs after the gathering of the harvest and presentation of the Snake Dance. 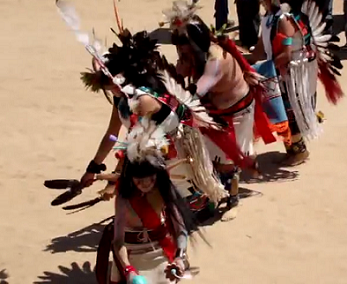 It is one of the most beautiful and spectacular of the Hopi ceremonial dances. Up to a hundred or more pairs of dancers will fill the village mesa to preform the dance. The main participants include both youths and adults. The village men provide the prayer songs for the dance. Everyone dances lightly, keeping time with the drumbeat while the dancers hand movement symbolizes the songs meaning. Like most Hopi ceremonies, the Butterfly Dance is a petition for rain, good health and long life for all living things. The dance also recognizes the butterfly for its beauty and its contribution in pollinating plant life. The spirit of the butterfly is also personified in Hopi kachina figures. The term 'Kachinas' can refer to spirits, dancers and carved dolls. Animals, plants, food, birds, insects, and even death itself is given a kachina form. 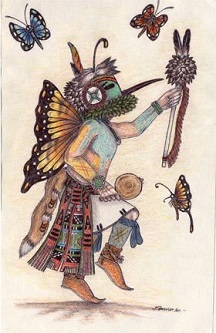 Among the various insect kachinas are three of butterfly origin. These are Poli Sio Hemis Kachina (Zuni Hemis Butterfly Kachina), Poli Taka (Butterly Man), and Poli Mana (Butterfly Girl). Butterfly figures are often found in prehistoric Hopi pottery and are frequently mentioned in Native American Mthology and folklore.